At Kommunion we are a diverse crowd of engineers and communication specialists. We are geeks at heart, and we have a passion for people and for the local Church. We love people through technology. What drives us is the opportunity to love people by building top of the line information technology solutions that enable our customers to love their people well. Among all our wonderful clients that Kommunion serve to the best of our ability, the local Church has a special place in our hearts. In fact, serving Churches, ministries and missions is our first calling as a company. Too often, the Church has to put up with leftovers and stuff that is second rate. We try to think differently. I wish my business had as excellent information technology as my Church has. We believe that a vision is a picture of the future that produces passion while pursuing it. Our vision is of a successful business man attending his local church by going to worship services, clubs, small groups, ministry groups, seeing his kids through youth clubs, Sunday school, choirs etc. And in all these facets of interacting with his local Church, the business man is exposed to and interacts with the information technology the Church uses to facilitate doing Church. 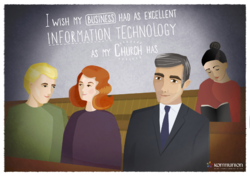 One Sunday morning, the business man sighs and leans back in his pew and says to himself: "I wish my business had as excellent information technology as my Church has." And we would like to respond to this by serving his business or NGO or other kind of organization with the excellence that overflows from the solutions we´ve built for the Church and Christian organizations. 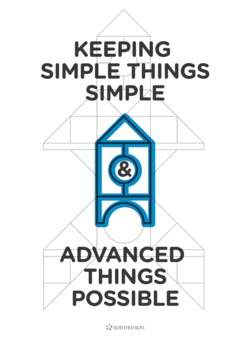 Our design principle: "Keeping simple things simple and advanced things possible"
Many systems out there are either incredibly complex to use - even for simple tasks - or they are extremely simple to use, but lack the power you really need from time to time. In Kommunion, we don´t like our computers to tell us that we are not allowed to do certain things. Yet, we love providing our users with the simplest possible user experience. Therefore, in everything we do, we try to make things as easy and as simple as possible, but no simpler. And when the need for something advanced comes up, and we fear that introducing the feature will get in the way of the simplest and most common tasks in the same area of the system, we always prioritize the simple function first. This does not mean that we do not offer the more complex features, but we might hide them away a bit deeper in the menu, or let you go through a couple of steps to get it done. This approach serves as a guiding principle in how all our developers do what they do. Kommunion is just a spelling variant of the English word communion, which means fellowship. We believe that this is the right paradigm with which to approach new media. The communication model of broadcast and print media does not fit the web. No longer do you have a small, select group of people communicating to the passive masses. In order to seek significance and influence, you need to engage and interact, you need to come alongside, equip and empower to build a following - not through hierarchies and formal structures, but through shared values and lives - through a mutual understanding and respect. Servant leadership - putting others first - is at the heart of the Kommunion philosophy of working with clients. That´s why we do the majority of our work with clients that share our core beliefs and values. When the client succeeds, we succed, because we are perfectly in alignment with their purpose.